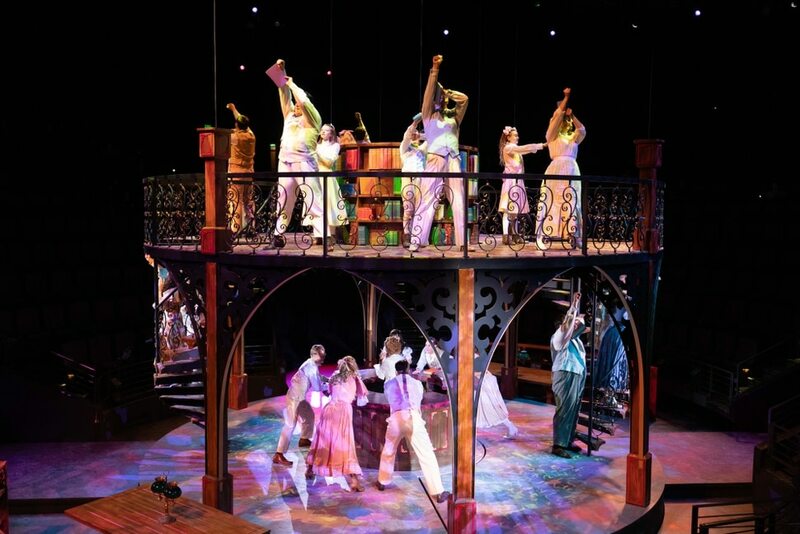 (photo courtesy Hale Centre Theatre) A two-tier set is descended from the ceiling in a scene from Hale Centre Theatre's 2018 production of The Music Man in the company's in-the-round Centre Stage. 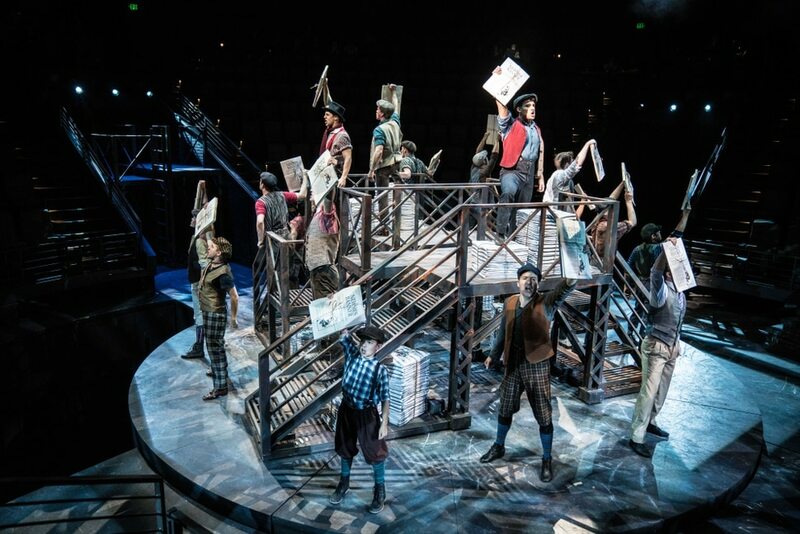 (photo courtesy Hale Centre Theatre) A scene from Hale Centre Theatre's 2018 production of Newsies in the company's in-the-round Centre Stage. 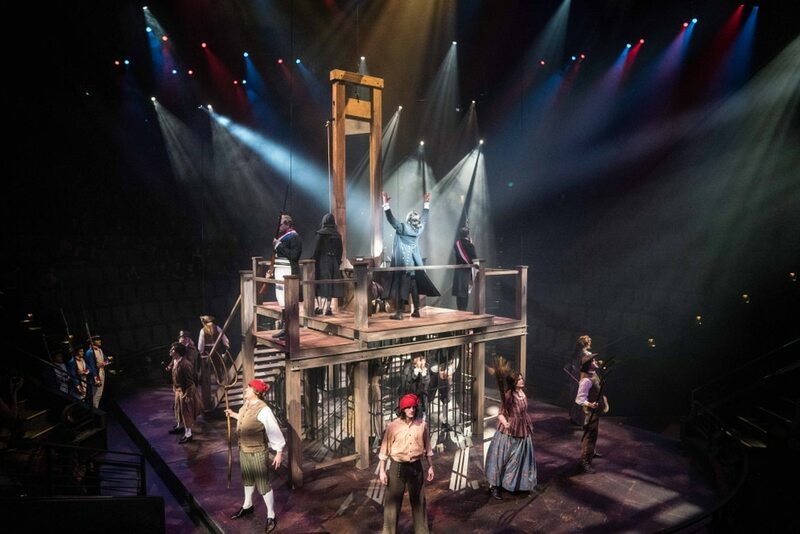 (photo courtesy Hale Centre Theatre) A guillotine and prison set descended from the ceiling for a scene from Hale Centre Theatre's 2018 production of The Scarlet Pimpernel in the company's in-the-round Centre Stage. (photo courtesy Hale Centre Theatre) Hale Centre Theatre's 2018 production of The Hunchback of Notre Dame highlights the technology of the in-the-round Centre Stage. Hale Centre Theatre offered 80 performances of the musical “The Scarlet Pimpernel” this fall; many were sold out. All of the tickets to its 50 planned performances of “A Christmas Carol” were claimed by Thanksgiving, “the quickest sellout” its holiday staple has ever had. The theater’s final tally for ticket sales in 2018 will top a half-million — its current estimate is more than 551,000. Is Hale’s splashy new two-theater complex in Sandy the key to success for the long-running nonprofit company? Executive producer and vice president Sally Dietlein has another theory — she boasts that Hale Centre Theatre has the best audiences anywhere. “People will call and say, ‘Can you get us a couple of tickets for Friday night? By the way, what’s playing?’” Dietlein said with a laugh recently, as the Mountain America Performing Arts Centre marked the first anniversary of its opening. The technical wizardry of the complex’s 907-seat Centre Stage is clearly part of the draw. The newest production to put it to the test: “The Wizard of Oz,” with 16-year-old Utah phenom Lexi Walker in her first stage role, starts Monday. The Centre Stage is a theater in the round, with 10 concentric circles of seating on a steep slope toward the middle, so even the back row feels close to the action. The stage is a marvel, with a floor platform that slides out to allow a massive rotating platform to rise from below. That platform has sections that rise and descend depending on the need. More sets are lowered from above on cables. And it’s all practically silent, any mechanical noise usually covered by music. And Hale Centre fans are enjoying it. Hale Centre is usually billed as a “community theater,” a designation associated with smaller, homegrown, sometimes amateur productions. Its fare is routinely family-friendly. Nothing with blood, strong sexuality or swear words will cross the Hale stage. The theater does hire performers who are in the Actor’s Equity Association, the stage actors’ union that requires livable wages and benefits for its members, but not many. Though Hale Centre is a member of the American Association of Community Theatre, Dietlein isn’t comfortable with the label. As a nonprofit, Hale Centre is eligible for Salt Lake County’s Zoo, Arts & Parks funding, raised through sales taxes. This year, Hale Centre received just over $1 million in ZAP money. Next year’s figures have not yet been announced, but Dietlein expected Hale’s funding to increase, considering the increased ticket sales. In the last year the company performed at its old theater, across the street from the Maverik Center in West Valley City, it sold 344,182 tickets. This year, nearly that many — 332,960, or 60 percent — were bought by the theater’s 29,078 season-ticket holders. For many, Hale Centre is a family tradition. For 2019, the Centre Stage will house big musicals such as “An American in Paris,” “Matilda,” “Phantom” (not the Andrew Lloyd Webber version), “Seussical” and a to-be-announced blockbuster this summer. Hale Centre’s second theater, the 467-seat Jewel Box Stage, has a traditional proscenium stage with a massive LED screen behind it to show animated backdrops. With so many performances, the actors’ schedules can be grueling, said Josh Richardson, who is playing Jacob Marley opposite Kerr’s Scrooge. That sense of family permeates Hale Centre’s productions, said Kerr, now in his eighth year as Scrooge. “There is a real sense of community there with the actors, and with the production staff,” Kerr said, adding that some cast members have been doing “A Christmas Carol” for 20 or 30 years. Recently, Kerr said, an actor who had played a charwoman in “A Christmas Carol” for many years was dying. With her family’s permission, some 50 of her castmates, past and present, gathered outside her home to sing Christmas carols to her. She died shortly thereafter. Hale Centre Theatre boasts a quirky history. Nathan and Ruth Hale, a young couple from Granger, Utah, started their first community theater in the Salt Lake Valley in the 1940s. They moved to Glendale, Calif., in 1943, as Nathan sought to be a Hollywood movie star. When that dream ended in disappointment, the couple started the Glendale Centre Theatre in 1947. In 1985, the Hales were getting ready to retire to southern Utah and sold the Glendale theater to Sandra and Allan Dietlein, their daughter and her husband. (It’s still running today.) The Dietleins’ son Mark and his wife, Sally, teamed up with his grandparents and another Hale daughter, Sally Hale Rice, to turn a shuttered South Salt Lake lingerie factory into the Hale Centre Theatre. 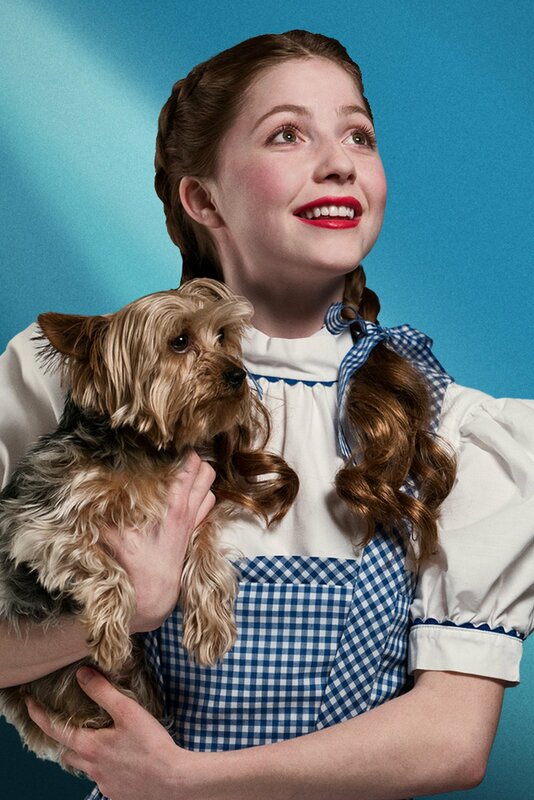 (Photo courtesy Hale Centre Theatre) Utah singer and YouTube star Lexi Walker will make her stage acting debut as Dorothy in Hale Centre Theatre's production of "The Wizard of Oz," which runs at Hale's Centre Stage from Dec. 10 to Feb. 2. • “The Wizard of Oz,” starring teen Utah singer Lexi Walker, runs Dec. 10 to Feb. 2 on the Centre Stage. Tickets are available at hct.org. • “A Christmas Carol,” Hale’s holiday tradition, is running through Dec. 24 on the Jewel Box Stage. The show’s run is sold out. Correction: An earlier version of this story carried a misidentified photo of Ava Hoekstra, the understudy for Dorothy in "The Wizard of Oz."